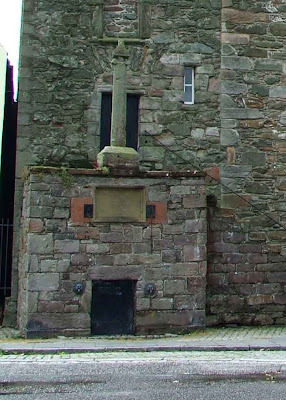 The Toll Booth can be found on the corner of High Street in Kirkcudbright. At first glance, the building looks like a church, with its three storey main building and clock tower. However, built in 1625, the building has been a toll booth for collection of local taxes, a prison, and today, an art gallery. Why has it been included on this blog? Well...to a degree this was a lightly defended building. 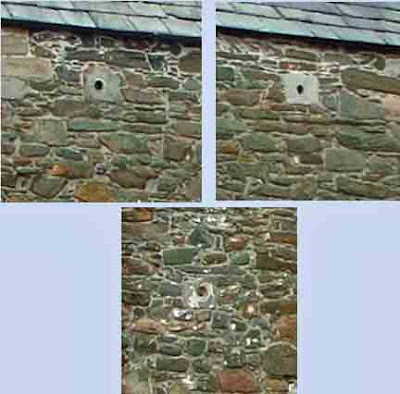 The photo below shows three gun loops that can be seen on the North face of the building. These may have been inserted into the front wall when the building was used as a prison, possibly to provide a small degree of protection against prison breaks. Notable prisoners included John Paul Jones, a local Scotsman who joined the first United States navy and was held as a traitor here, Covenanters during the 1680's, and locals accused of witch craft. The last period of building took place sometime around 1751. With walls some 4 feet thick, this represents a fairly safe building in which to imprison local miscreants. The building seen today, replaces an earlier building. This is described in historical records as "recently demolished in 1570"
The steps and the balcony at the foot of the tower, house a market cross, a well or a drinking fountain, and some 'jougs'.....iron neck collars used to keep offenders from escaping....a form of stocks where the local population could relieve a little anger at their misdeeds. 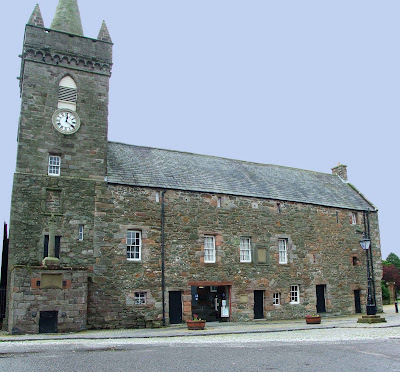 This link to the Visit Kirkcudbright website provides some additional information on the Toll Booth in its present incarnation as an art gallery, as well as Kirkcudbright the town. Nice photo of the tolbooth...i've been trying to get one for ages without any cars infront of it!